Among Avatar‘s many messages (something about American Indians? Vietnam? Fern Gully? ), an environmentalist overtone proved most important to the movie’s plot and thrust. Fox will be releasing its first of three separate DVD and Blu-ray releases on Earth Day, as a tie-in. It’s true, the theme here is green–just not the green you’re thinking of. 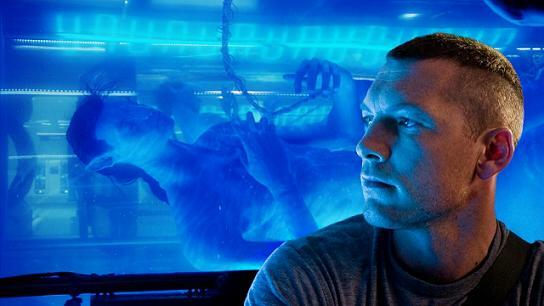 As one of the most successful movies of all time and certainly the biggest money-maker of the year for Fox, the studio won’t miss a chance to inject a little greenwashing into Avatar‘s first DVD release–except, of course, it’ll be physical media only, which means they’ll be producing spaceship-loads of plastic for the packaging and discs. Even worse, to wrangle the most cash out of its biggest cash cow, Fox isn’t stopping at one, but opting for a whopping three separate Avatar releases. The first is, not surprisingly, the worst: either DVD or Blu-ray (no digital downloads, which are relatively green), with absolutely no special features (what? ), and in 2-D only. Tons of consumers will buy this edition on Earth Day, April 22, only to have it become trash in a few months as Fox releases the actually desirable versions of Avatar months later. This first release will be just the movie on a disc: no deleted scenes, interviews, commentary tracks, extended cuts, behind the scenes clips, or any other special features. Fox claims this is to present the best picture and sound possible without compression, but they could just as easily have created a double-sided DVD or dual-layer Blu-ray–on the other hand, who would buy the “ultimate edition” if they did that? The “ultimate edition” of Avatar will be released sometime in November, with the special features that should have come in the initial release, but even that will still be in 2-D. The 3-D versions won’t come out until 2011, when Fox expects more consumers to have adequate 3-D televisions, and it’s unclear when, if ever, a digital version will be released. This staggered release is almost obscene in its crass shrewdness. How is it even remotely acceptable to release a film without any special features, without the one technological feature (3-D) that made the film unique in the first place? And on Earth Day, claiming a thematic link between the film and environmentalism, only to sell a product which in a matter of months will be obsolete and disposable, achieves a remarkable feat by managing to demean a holiday created in 1970 to teach elementary school students about the dangers of littering. Avatar‘s first release will come this April 22. Verdict: avoid. It’s bad for the environment and your wallet.